"Columbus experiments with protected bike lanes"
"The 'Big 3' Benefits of Riding a Bike to Work"
So you've been "bike curious" for a while now, eh? Well now's the time! But making the switch from car to bike—well, from "how on earth do I carry all that stuff?" to "sweat!" to "ummmm...cars, ack?!?! ", it's understandably a confounding transition. Here's why you should do it anyway. Between Mayor Coleman and Stinger riding alongside our group of 50ish cyclists, this year's Bike to Work Day was kind of a hoot. We again hosted two routes, one starting at Whole Foods Market in Upper Arlington to meet up with the other, which launched from Goodale Park. Combined we rode into Downtown, where we converged on Columbus Commons with other groups of cyclists riding in from all over town. A big party, some free food and beverage, several speakers and a rain shower later, and we were all ready to ride on in to work. Tada! Until next year, friends! Check it out in the Dispatchor on our Facebook pagephotos! "Statewide Effort to Donate 9,300 Bike Helmets to Kids"
People for Bikes' article "BOSTON, COLUMBUS, DETROIT, INDY, MINNEAPOLIS, HOUSTON, DENVER & SEATTLE ALL UNVEIL PROTECTED LANES" "...Columbus, Ohio said Feb. 2 that a 1.4-mile bidirectional protected lane on Summit near the Ohio State University is "just the beginning" of plans for biking improvements, thanks to advocacy group Yay Bikes and a receptive city staff..." See what they had to say here. This Lantern TV news story gives air time to the planned cycling improvements on Summit and 4th streets. The segment starts at the 5:32 minute mark and runs through 7:27. Check it out here. Riding north on 4th Street, and approaching I 670? We have good news for you! "Drivers and bicyclists who use 4th Street leaving Downtown likely are familiar with what some have called a head-scratching conflict point for commuters. "Just before the entrance ramp for westbound I-670 on the left of the street, the dedicated bike lane crosses a lane of vehicle traffic that is merging left to enter the ramp. "Both lanes are set up for continuous flow, and there is no clear instruction on which lane should yield. Yay Bikes Executive Director Catherine Girves calls it the “teleport zone. The city, though, is planning a fix"...Get it here! Everything you should know about the changes being proposed on Summit and 4th Streets. Columbus Underground reports: "A protected bike lane is planned for a 1.4-mile portion of Summit Street in the University District. The new lane will be ten feet wide and will run from Hudson Street to 11th Avenue, providing both north- and south-bound travel lanes that are separated from car traffic by a two-foot buffer and an eight-foot parking lane. "South of 11th, a single, unprotected bike lane will continue through Weinland Park, Italian Village, and Downtown (on Third Street). A similar, unprotected, bike lane would be added to Fourth Street, from Hudson to the southern edge of Downtown." "Other new bike infrastructure – “bus bulbs” that provide bus boarding areas that don’t conflict with bike-lane traffic, “queue boxes” that make it easier for cyclists to turn left on busy streets, and a new strategy for getting cyclists safely past cars merging onto freeway ramps – will also be part of the project..." - Read more here. Today, the Columbus Dispatch reported: "Columbus is getting its first protected bike lane as part of a plan to resurface Summit/3rd and 4th streets and add bike lanes along the heavily traveled corridors. "Bike lanes will be installed along those routes between Fulton and Hudson streets, with a 1.4-mile section of Summit developed into a two-way, protected bike lane. 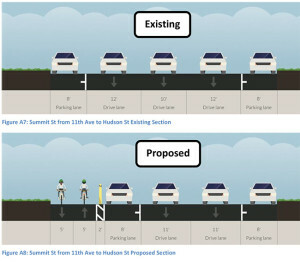 That section will be between 11th Avenue and Hudson Street in the University District, and shielded by on-street parking. "Original plans called for a conventional bike lane, but the city reconsidered its position after engineers rode with representatives from Yay Bikes, a local advocacy and education group. “They’re coming up with really good solutions just because they’re understanding from a different perspective — from the seat of a bicycle,” said Catherine Girves, the organization’s executive director. "She said the new bike lanes will be useful for both new and experienced bicyclists, who sometimes eschew lanes because it’s more convenient to ride with traffic. "Adding protected bike lanes near Ohio State University, an area heavily populated with bicyclists, also can act as a model for the rest of the city, Girves said. “As a test site, this is the ideal place,” she said." "Metro Parks expect record year"
"‘Engineer Rides’ Part of Bike Lane Collaboration with Yay Bikes"
"With $200,000 from city, CoGo Bike Share to expand next year"
"Q&A: Meredith Joy of Yay Bikes!" Q&A: Meredith Joy of Yay Bikes! "Cyclists, drivers seek truce at gathering"
"Dialogue designed to assuage battle of bikes versus cars on local streets"
"Safety Inroads: Despite recent accidents, Columbus is losing its training wheels as a bike city"